Home / Savings Blog Posts / Holidays / Christmas Recipes / Crockpot Hot Chocolate Recipe! This Crockpot Hot Chocolate Recipe is a Simple and EASY Party Recipe and Holiday Treat for a Snow Day or Christmas Hot Drink Recipe in the Slow Cooker! 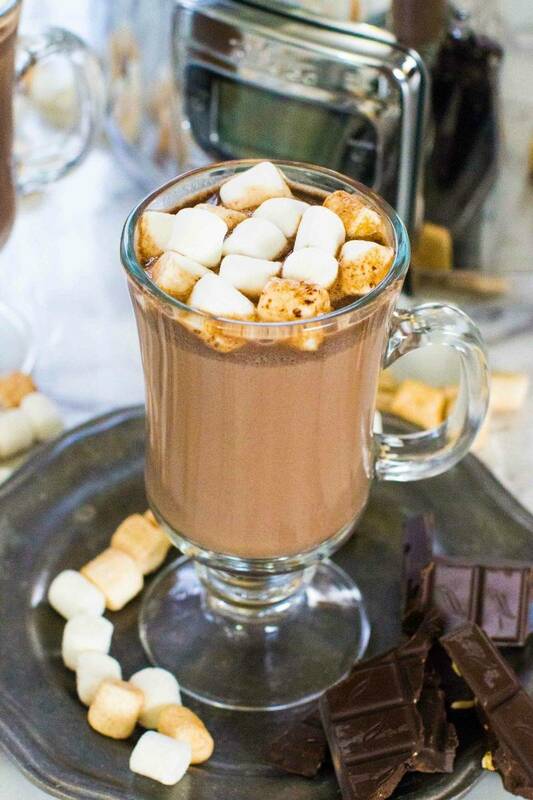 Check out this Crockpot Hot Chocolate Recipe for Thanksgiving and Christmas! If you are looking for an easy Crockpot Hot Chocolate Recipe, this one is perfect to throw together when you are in a hurry or need a quick go-to hot drink recipe! I can’t wait for cold snowy and rainy nights at home with the family. Pop in a movie and enjoy this delicious recipe with your loved ones! If you are having a Christmas or Holiday party then this is a great recipe to throw in the crockpot before your party begins so that it is ready to go when you need it (and you don’t have to spend your party time making it)! I love Crockpot Recipes for parties and events with a crowd of people! Plus, be sure to check out even more Christmas Recipes for must-try desserts to go with this drink recipe! Combine All Ingredients Except for the Chocolate Chips in a Crockpot and whisk until well mixed. Stir and Serve while warm, You may also reduce to warm or low after 2 hours to keep this hot longer. Also, have you ever heard of a Hot Chocolate Bar?! This would be fun to create on a snow day or for a Christmas party! Just get your favorite Hot Chocolate Toppings – chocolate shavings, peppermint chips, marshmallows, caramel, whipped cream, and more! Let your guests create their own Hot Chocolate as a fun treat and dessert recipe! Plus, be sure to check out the Crockpot Deals at Amazon if you have been looking for a new one or wanting to grab an extra! Receive Free Shipping with Amazon Prime, or Free Super Saver Shipping on orders of $35 or more! Loved this! I made it for a cookie exchange and was so happy with how rich and chocolately it was. I’ll definitely be making this again. How much does this yield? I want to make it for my class and not sure how much to make? can you substitute the half&half for light cream and the 2% for 1% milk? Made this today. Huge hit with kids and adults! Thank you! Your printable recipe card doesn’t have the half & half in the ingredients. Thank you for the heads up. We noticed this last week also and the recipe has now been updated. White Chocolate Cranberry Cookies Recipe!